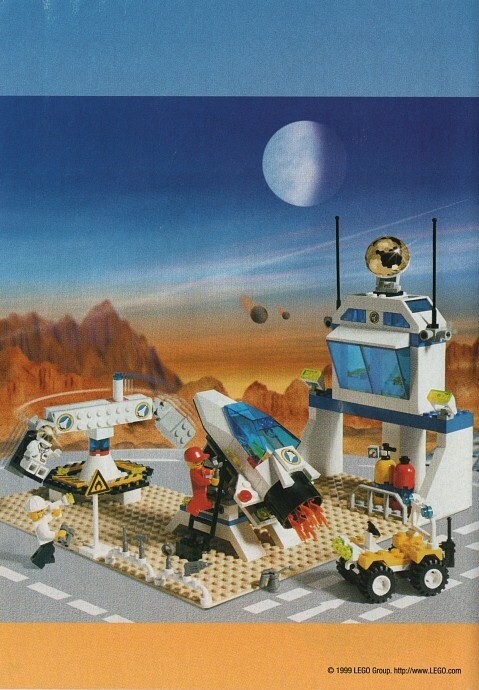 Today's random set is 6455 Space Simulation Station, released in 1999. It's one of 63 Town sets produced that year. It contains 245 pieces and 3 minifigs, and its retail price was US$30. It's owned by 1245 Brickset members. If you want to add it to your collection you might find it for sale at BrickLink or eBay. Ooo, a Town set. And the crowd goes wild. 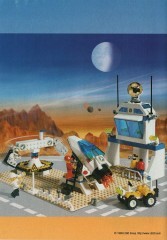 I found these Spaceport sets from '99 were on the lower end of the "at least it's not Town Junior" period of the late 90s. There were still a lot of big, blocky pieces, and while the theme wasn't as lovely as RESQ or Team Extreme the year before (or that wonderful Divers line from '97), it could've been a lot worse. But we were spoiled with the Spaceport line from '95 or '94, so I never picked up any of these. Now I hope the coming city sets are somewhat like this. There's actually a children's early reading book that goes with this set. Anyone else read it? What planet is it on...? I just got this set in a random lot of LEGO off EBay. It was a nice surprise as I didn't realize it was in the lot before I bought it. That rocket looks like a shoe. I have most of the Space Port sets (actually, maybe all but one), for some mysterious reasons I decided this to be the first line to collect coming out of my dark ages. Overall, they are quite ok and taken all of them together offer quite good play. But as somebody said above, they also have a tendency to be made out of big parts, and some have a rather uninspired design. This one, though, is definitely one of the better ones. This set really foresaw NASA's budget cuts, huh. I didn't remember I had read it until you mentioned it. @BionicMarz: Yep! I remember that book. From what I can recall, It had a young astronaut named B-B going into training to go to Mars (a Life on Mars prequel perhaps? ), but then he was sent to rescue a misaligned satellite first... sound about right? What is this OHSA of which you speak? @sbpyrat I love when that happens, happens to me a lot with BIONICLE and Minifig lots. Has a bit of a birthday gift aspect to it. @Murdoch17 I haven't read the book, but I do seem to remember BB having a bit of an backstory in LoM. It's always nice when LEGO adds things to tie themes together. I'm listening to music while browsing, just before getting to this article I was listening to "Little Rover by Stupendium" and right now I'm listening to "Space Oddity by David Bowie." It's always nice to see a Space set pop up, but it's even better when I'm in a space mood! @MataNui2009 Yeah me too. This one was particularly good. I could tell in the pictures that most/all of an old pirate set and a dirt bike hauler were in the set. Turned out it was most of 4 old pirate sets, a dirt bike hauler, and this space port set. Definitely worked out to be worth the $20+$20 shipping I paid. I've been buying a lot of thrift store LEGO the past 1-2 years and have gotten pretty lucky on some of the sets I've been able to make from them. The best was a Facebook lot of 4+ tubs for $100 with mostly dozens of partially assembled sets that I've been slowly been completing...I've done a lot, but maybe 25% done going through it all. I find it really satisfying to complete sets, but it's taking away from my time to build new sets and work on custom stuff. I need to find a balance haha. I still think it'd be awesome if LEGO Friends were to introduce a "space camp" subtheme with various tests and simulations leading up to a real space mission! Why is this not tagged "juniorized"? Kalking, how dare you assume this would be $50 if released today! It contains a baseplate, it would never be released today!